A massive cluster of galaxies appears caught in a web of distorted background galaxies in the image above, taken with the Advanced Camera for Surveys (ACS) aboard NASA's Hubble Space Telescope. The gravity of the cluster bends and magnifies the light of the galaxies behind it, an effect called gravitational lensing. The faraway galaxies appear in the Hubble image as arc-shaped objects around the cluster. The increased magnification allows astronomers to study remote galaxies in greater detail. Credit: NASA; ESA; L. Bradley (Johns Hopkins University); R. Bouwens (UCSC); H. Ford (Johns Hopkins University); and G. Illingworth (UCSC). The detailed images from Hubble's Near Infrared Camera and Multi-Object Spectrometer (NICMOS) reveal an infant galaxy, dubbed A1689-zD1, undergoing a firestorm of star birth during the dark ages, a time shortly after the Big Bang but before the first stars reheated the cold, dark universe. Images from the Spitzer Space Telescope's Infrared Array Camera provided strong additional evidence that it was a young star-forming galaxy in the dark ages. "We certainly were surprised to find such a bright young galaxy 13 billion years in the past," said Garth Illingworth, professor of astronomy and astrophysics at the University of California, Santa Cruz, and a member of the research team. "This is the most detailed look to date at an object so far back in time." "The Hubble images yield insight into the galaxy's structure that we cannot get with any other telescope," added astronomer Rychard Bouwens, a postdoctoral fellow at UCSC and one of the co-discoverers of this galaxy. Current theory holds that the dark ages began about 400,000 years after the Big Bang, as matter in the expanding universe cooled and formed clouds of cold hydrogen. These cold clouds pervaded the universe like a thick fog. At some point during this era, stars and galaxies started to form. Their collective light reheated the foggy, cold hydrogen, ending the dark ages about a billion years after the Big Bang. "This galaxy presumably is one of the many galaxies that helped end the dark ages," said astronomer Larry Bradley of Johns Hopkins University, who led the study. "Astronomers are fairly certain that high-energy objects such as quasars did not provide enough energy to end the dark ages of the universe. But many young star-forming galaxies may have produced enough energy to end it." 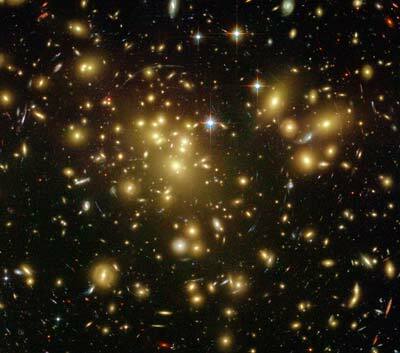 Astronomers used a relatively nearby massive cluster of galaxies known as Abell 1689, roughly 2.2 billion light-years away, to magnify the light from the more distant galaxy directly behind it. This natural telescope is called a gravitational lens. Even with the increased magnification from the gravitational lens, Hubble's sharp "eye" can only see knots of the brightest, heftiest stars in the galaxy. The telescope cannot pinpoint fainter, lower-mass stars, individual stars, or the material surrounding the star-birthing region. To see those things, astronomers will need the infrared capabilities of NASA's JWST. The planned infrared observatory will have a mirror about seven times the area of Hubble's primary mirror and will collect more light from faint galaxies. JWST also will be able to view even more remote galaxies whose light has been stretched deep into infrared wavelengths that are out of the reach of NICMOS. The astronomers noted that the faraway galaxy also would be an ideal target for the Atacama Large Millimeter Array (ALMA), which, when completed in 2012, will be the most powerful radio telescope in the world. "ALMA and JWST working together would be an ideal combination to really understand this galaxy," Illingworth said. "JWST's images and ALMA's measurement of the gas motions will provide revolutionary insights into the very youngest galaxies." For images and additional information about A1689-zD1, visit the Hubble and Spitzer web sites. The Hubble Space Telescope is a project of international cooperation between NASA and the European Space Agency. The Space Telescope Science Institute conducts Hubble science operations. The institute is operated for NASA by the Association of Universities for Research in Astronomy, Inc., Washington, D.C. Note to reporters: You may contact Illingworth at (831) 459-2843 or gdi@ucolick.org.